Because of Thanksgiving, our Cub Scout den did not have a regular meeting last week. Instead, I offered to host a Geology Night for any of the boys who would be in town. This was the third time I've hosted a belt loop night. (Click the links to read about Astronomy Night or Hiking and Photography Night.) I decided to be extremely ambitious and cover the three belt loop requirements AND the five pin requirements. When I made my sample, I immediately realized that I'd need to pre-paint the rocks for the boys. The painting process (or, more accurately, the drying process) was very time-consuming. Gesso on the front, let it dry, gesso on the back, let it dry, brown paint on the front, let it dry, brown paint on the back, let it dry, brown touch-ups on the front, let it dry, brown touch-ups on the back, let it dry. Life would be much easier if the boys started with painted rocks. The others went their own directions, which is awesome. 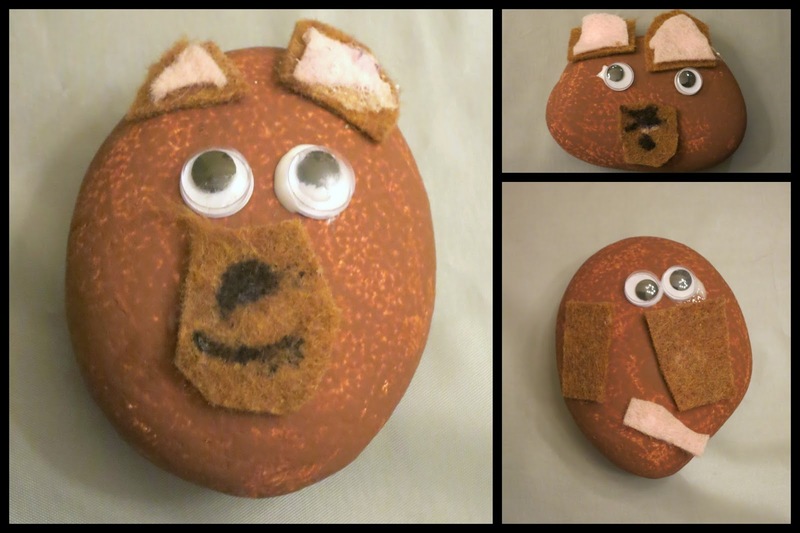 As they finished their pet rocks, I asked each boy to come up with name for his pet and to prepare a creative story. Some chose to write their story, while others drew a habitat to go along with the story. Then each boy presented his bear and story to the group. Tomorrow I'll share what we did for the three belt loop requirements and the other four pin requirements. You do the neatest things! This must be the happiest, most creative, and forward thinking cub scouts there are! So fun! I loveeeeee their bears!!!!!!! So creative, Cindy. What a cute idea and so fitting too. I bet the boys loved doing them. They turned out great.